"A moist, cake-like Irish Soda Bread that's not just for St. Paddy's Day... it's so easy and sooo delicious you'll be craving it all year 'round." Stir together the flour, sugar, salt, baking powder, and baking soda in a large bowl. Using a pastry cutter, cut the butter gently into the flour mixture until well combined, and stir in the raisins. In another bowl, whisk the buttermilk and eggs together; lightly beat the buttermilk mixture into the flour mixture. Place the dough into the prepared cake pan. Bake in the preheated oven until the bread has risen and the top is golden brown, 45 minutes to 1 hour. A knife inserted into the center of the bread should come out clean. Cool the bread in the pan on a wire rack for 10 minutes before removing. Serve warm. 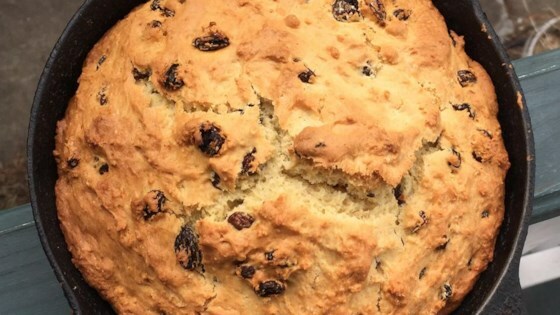 Great recipe...not like a traditional Irish soda bread...this is really like a cake. I added a touch of vanilla. It's delicious!